Description The first convincing realisation of the concept of cyclic pitch control was seen in helicopter nr. 3 by Pescara. This was a huge machine with a large engine and a total of 16 rotor blades in a coaxial rotor system. 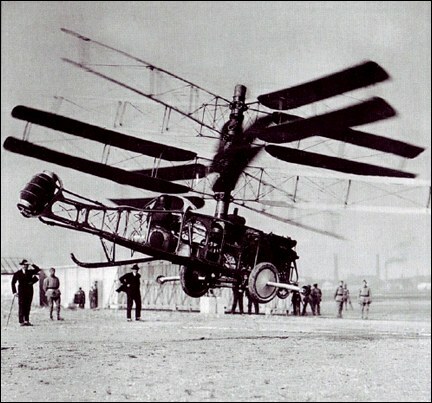 Each of the eight rotors was built like a biplane wing. This helicopter demonstrated that it was possible to fly slowly in such a machine. It flew several flights of about 10 minutes in duration and also set a distance record of 2415 feet (736 meters). Pescara's helicopter no. 3 was thus a success. The first convincing realisation of the concept of cyclic pitch control was seen in helicopter nr. 3 by Pescara. This was a huge machine with a large engine and a total of 16 rotor blades in a coaxial rotor system. Each of the eight rotors was built like a biplane wing. This helicopter demonstrated that it was possible to fly slowly in such a machine. It flew several flights of about 10 minutes in duration and also set a distance record of 2415 feet (736 meters). Pescara's helicopter no. 3 was thus a success. Do you want to comment the Pescara Coaxial Helicopter helicopter?